Death/doom metal - guide to the music style, find the best bands right here! Death/doom metal (also written as death doom, doom death and doom/death) is a genre that mixes the slow, mournful atmosphere of doom metal with the aggression of death metal. 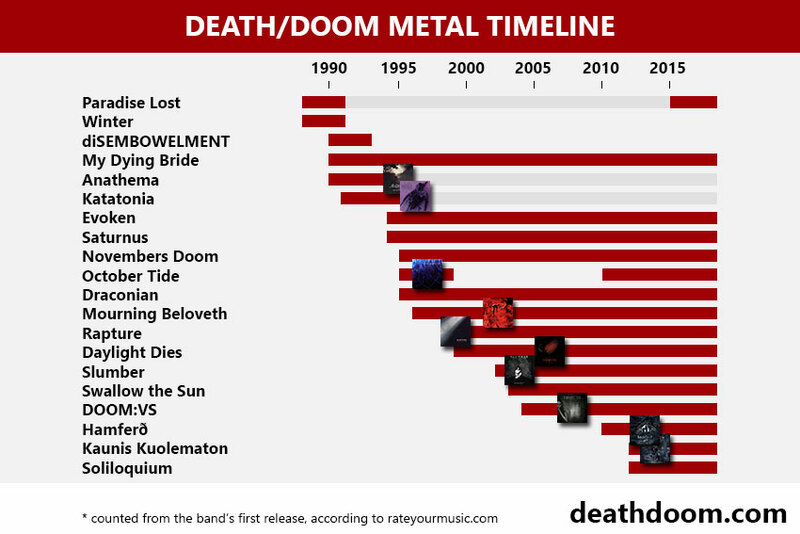 The tendency to slow down death metal music started in the late 80’s. This led to a death/doom explosion in the early 90’s; especially in England, Sweden and Finland. Below is a timeline that captures some of the most important bands and releases from the genre. Read 10 essential death/doom metal albums to explore the releases marked in the infographic below. Some of the most famous death/doom metal bands are Paradise Lost, (early) Katatonia, (early) Anathema, Swallow the Sun, Amorphis, My Dying Bride and Novembers Doom. It’s also popular to include the slower, dirgier death metal bands like Asphyx, Autopsy, Incantation and Winter. Some of the originators abandoned the death metal elements and explored other music styles. Katatonia and Anathema turned to clean vocals and various rock influences. Paradise Lost did the same before returning to death/doom in the 2010’s. If you want to let the death/doom metal music flow instead of reading a bunch of text, just start up my YouTube playlist or Spotify playlist below and lean back. Many newer bands are playing death/doom metal as well. The 2000’s have seen great bands like Rapture, Slumber, Mourning Beloveth and Daylight Dies. There are also promising bands like Kaunis Kuolematon, Ocean of Grief, Lying Figures, Somnent and Marianas Rest that are right in the beginning of their career. Check out my list of death/doom from 2018 if you want to find some fresh music. 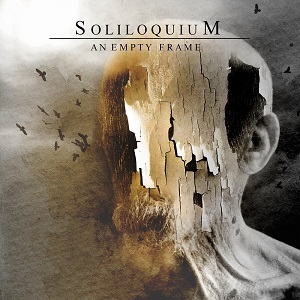 My band Soliloquium also has a full-length album called “Contemplations” coming out on June 1st, 2018. Katatonia’s “Brave Murder Day” is the ultimate death/doom metal album for me. It’s had a strong influence on the genre, especially the newer bands. The sleepy, repetitive shoegaze-influenced 4/4 beats and monstrous growls creates something otherworldly that many bands try to replicate, with varying results. The early albums from the British scene (Paradise Lost, Anathema, My Dying Bride) are also blueprints for a lot of music in the style. Slumber’s “Fallout” is a remarkable album from the 2000’s. Slumber is also connected to a bunch of quality bands like Enshine, Atoma and Exgenesis. It’s the only death/doom album that beats “Brave Murder Day” for me. If you want to find a good starting collection you should check out my list of the 10 essential death/doom metal albums. There are also subgenres within the subgenre. Funeral doom is notoriously slow doom metal with long songs. As the name suggests, it’s funeral music merged with doom metal. Important funeral doom bands include Evoken, Skepticism and Doom:VS. Doom:VS has a particularly tasty mix between funeral doom tendencies and death/doom metal. Melodic death/doom is a combination of death/doom and melodic death metal. Insomnium is a textbook example. Rapture is also an interesting combination of melodic death metal and Katatonia-style death/doom metal. Many of the elements in the gothic doom metal style is also derived from early 90’s death/doom. This is especially apparent in early gothic metal originators like Theatre of Tragedy. The heritage is alive today in gothic death/doom metal bands like Draconian.